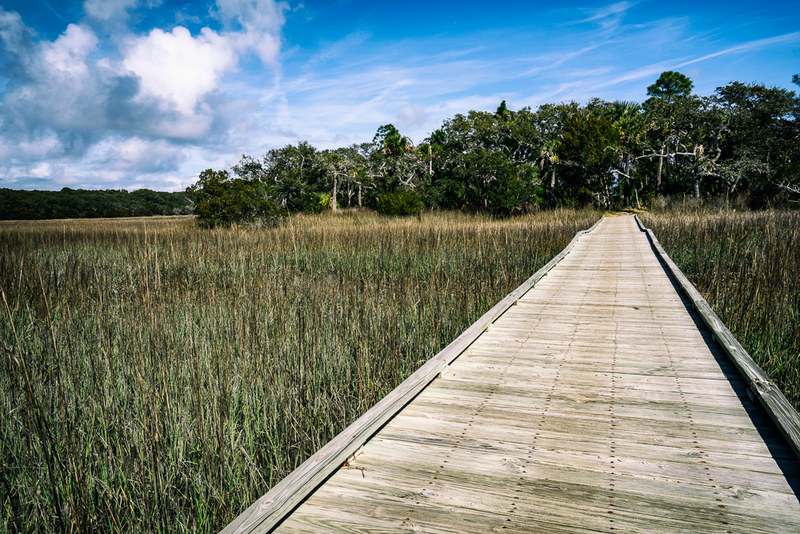 A boardwalk over the salt marsh in Edisto Beach State Park. This was on the Scott Creek Trail. In early March we took our inaugural camper trip to Edisto Beach, SC. 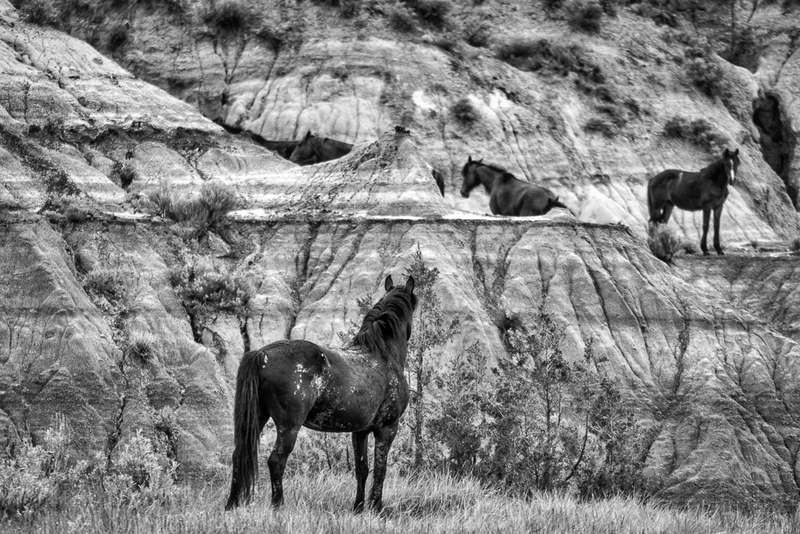 We chose Edisto Beach (pronounced EH-dis-toe) because it was relatively close, the campground was only about half-full and had received good reviews, and the surrounding area seemed to present some interesting opportunities for photography. It was a terrific choice! I’ll write in more detail about the camper experience in a future blog post, but for now, I’ll focus on reviewing the Edisto Beach State Park campground. We chose to stay in the Live Oak Campground section as opposed to the beach front campground section because we wanted space and privacy—and I think we’ve been spoiled for future campgrounds! Looking up from our campsite into the trees covered in moss with a blue sky background. Our site was lovely and shaded and HUGE! It was almost perfectly level and overlooked the salt marsh, giving us a beautiful view of the sunset each night. The site was surrounded by palm trees and vegetation making it feel like our own private oasis. And we could still hear the ocean! We stayed in site 118, but there were several near us that looked nearly as private—117, 122, and 124, especially. Due to unforeseen circumstances, we needed to rely on their bathhouse facilities, and thankfully they were very clean and just a short walk away. The garbage and recycling were on the way to the bathhouse and the dump station was just a short drive from the campground. The atmosphere was quiet and peaceful and surrounded by nature. A cardinal that I kept stalking on the trails around out campsite. We took advantage of some of the trails from the campground that took us through the marshes and out to a boardwalk along the river. We only passed two people on bikes and a number of cardinals, bluejays, and other birds. We explored the salt marshes and the beach and the park via quiet, well-maintained, and serene paths—most of which took us through or near the campground. There was not a lot of activity or people—just the way we like it. For a few days, life moved along at a different time, perfect if you are looking for a relaxed, slow-paced time away from it all. We also explored Botany Bay Plantation and the beach there—just gorgeous. See Dave’s blog on Botany-Bay for more on that magical, pristine, other-worldly location! Michelle being spooky in one of the trees at Botany Bay Plantation, SC. Our eldest Brittany, Marduk taking advantage of some off leash time at the beach. The sign said dogs could not be off leash in peak season: yet another reason to plan trips in the off season! I should add the disclaimer that we like the beach best when it is deserted and a little chilly! Edisto Beach, SC is a lovely little area and we appreciated the general lack of commercialization. Our dogs were able to run off-leash on the beach and had a blast (dogs must be on-leash May-October)! Most of the time we had the place to ourselves, except for the occasional kayaker or sea gull. We even had one night out for seafood at a fun little restaurant called Seacow Eatery—great pie and friendly staff! Golden Hour at the Big Bay Creek at Edisto Beach State Park in South Carolina. This was taken on the boardwalk that crosses the salt marsh. Print Available.